Nothing says summer like a good Creamy Whip… and Day 29 of “365 Things to do in Cincinnati” must say SUMMER because today we’re at the Goody Shop! Aptly named, the Goody Shop sells all kinds of good stuff – from the typical cones, to flurries, all the way to chili dogs and brats. 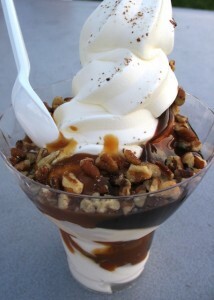 Above you’ll see my favorite selection, the Turtle Sundae (that one happens to be the small size – they have larger ones too). 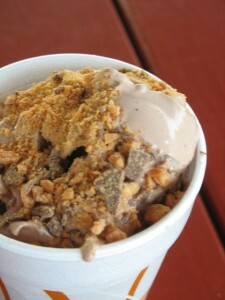 My daughter’s favorite is the flurry with chocolate ice cream and Butterfingers. Happiness in a cup! And don’t feel like you have to go all the way to Kings Island for that blue creamy whip because the Goody Shop is serving it up too! 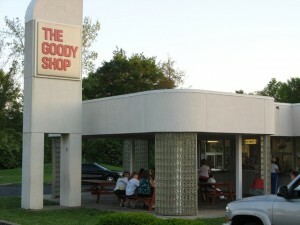 The Goody Shop has plenty of room to eat under their covered patio area. There is plenty of grassy area off to the side and that spot has some picnic tables as well as room to let the kids play. There’s plenty of parking too. They even have a drive thru! Are there any other creamy whips in town that actually have a drive thru? Be sure to visit the Goody Shop for all your creamy whip needs 🙂 . They’re located at 2009 Springdale Road, 45231. The best creamy whip I know of is Mt. 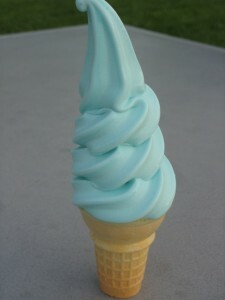 Washington Creamy Whip, at the site of the old Mt. Washington Bakery on Beechmont Avenue. The owner is the brother of the former bakery owner, and regularly bakes some 75 year old sweets recipes. The interior is very reminiscent of the old bakery floor. Old photos of Mt. Washington, as well as old Downtown street signs adorn the walls. A few tables are located out front, while a new indoor seating area should be opening any day now. Mt. 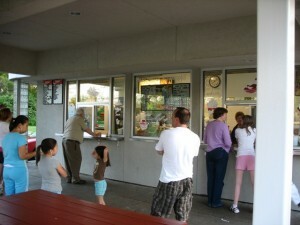 Healthy Dairy Bar has a drive thru and they have the best home made sherbet in town, many different flavors, they change weekly. Check them out.